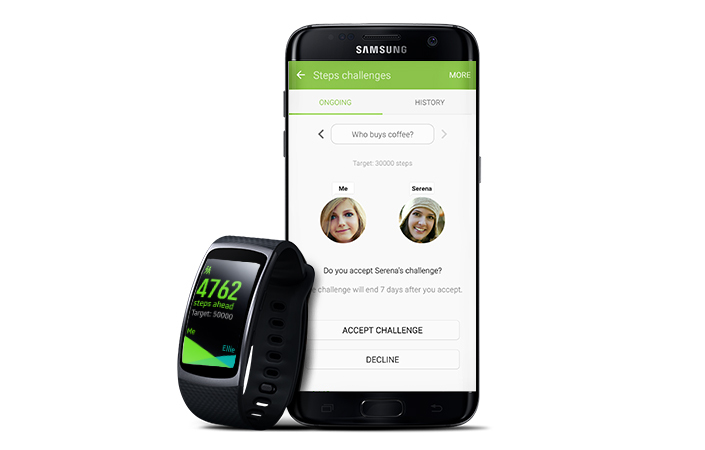 With over 150 million users globally, Samsung’s S Health application helps users to better manage their health and track their fitness progress. Now, with a new update that was released with the launch of Gear Fit2* earlier this month, S Health offers more features and functions to make exercise fun, and fitness goals more attainable. To motivate users to be more active, S Health v.4.8 adds an element of competition to your fitness routine with Together. First of all, the game-like concept of Steps challenges enables you to create a one-on-one match with your friend. Simply select a friend to challenge, select a step target, create a name for your challenge and send the invitation. Compete to be the first to reach the set steps target, while monitoring your step count and your opponent’s along the way. Falling behind? S Health alerts you as to how many “steps” you need to take the lead. 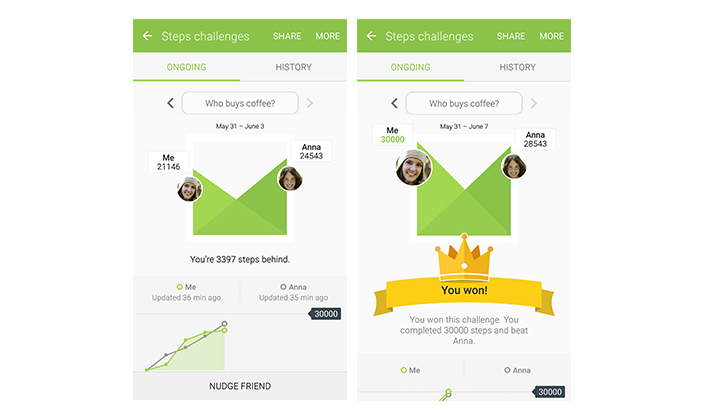 The Steps challenges allow you to gain a more immediate sense of accomplishment, not to mention bragging rights. Of course, you can monitor the status of all your challenges with your new Gear Fit2 from your wrist. But the fun doesn’t end there. 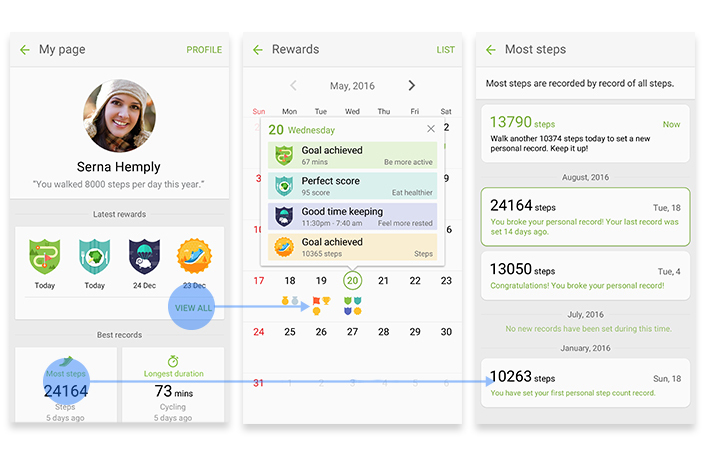 With the Steps leaderboard function, you can also compare your own step counts with those of your friends, your age group or all S Health users around the world. Once activated, the comprehensive Steps leaderboard provides data from the previous seven days, such as average step count, distance and calories burned in comparison to other users. Here you can check your rank and your competitors’ step counts. With the new S Health, you also have access to more comprehensive step count information. In addition to being able to monitor step count and distance walked data from each individual source—like your smartphone or wearable device—you can also estimate your total step count with the All steps option. 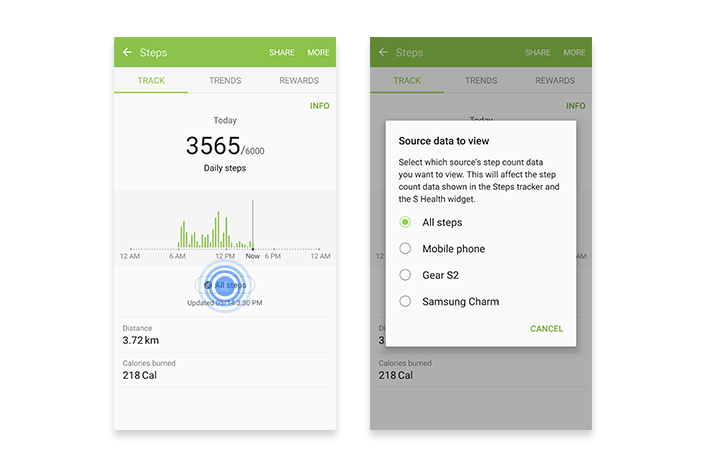 Should you enable All steps, your total number of steps across all devices and select third-party apps will be displayed in the Steps Tracker and the S Health widget. The S Health update also features a faster and simpler way to record various activity data. Now, with the Detect Workouts function, the app can automatically detect and log your running, cycling, walking and hiking sessions that occur for at least 10 minutes. Turning on the Auto Pause setting will also improve tracking accuracy, as it will recognize when you stop your exercise session. Customizing the S Health dashboard has never been easier with the more organized Trackers management list, which is now arranged in two different sections. Exercises are now listed separately from general health measurements such as weight and caffeine intake. From the Exercises list, you can select from more than 40 types of exercise that you’d like to manage, ranging from Hula-hooping to Push-ups to Yoga. 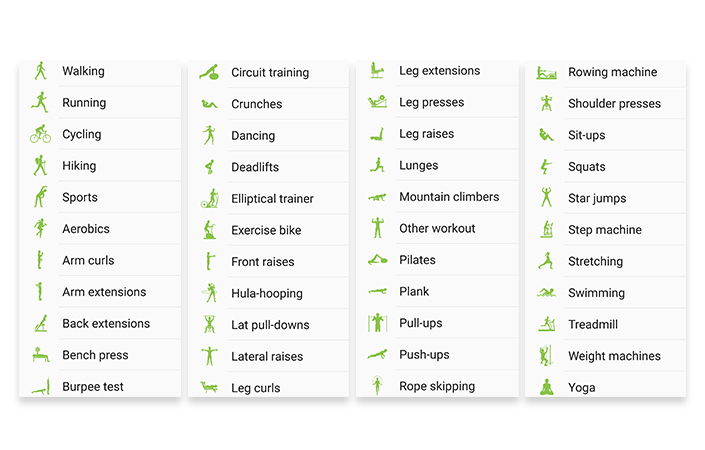 With these added exercise options, you can customize the Trackers on the S Health dashboard based on your fitness preferences, and record individual workouts more accurately. For a more generalized overview, the updated My page keeps track of your weekly activities by displaying a detailed weekly summary, rewards received, program history and a compilation of personal bests. Using this accumulated data, the app will suggest goals and targets to work towards in the future. You can now also measure your heart rate quickly, wherever, whenever, without having to launch S Health. After activating the Quick Measure** feature, simply place a finger on the heart rate sensor and set the device facedown to complete the reading. 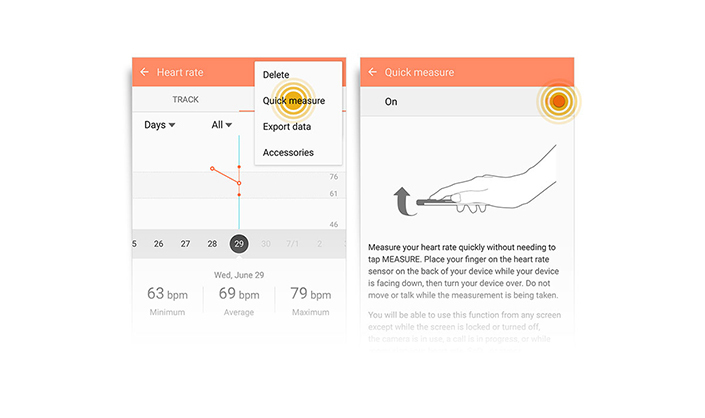 Heart rate information, along with other data such as blood pressure measurements and glucose levels can be exported as HTML, XLS and PDF files with a simple tap. Not only can you track more types of exercise, and have fun while doing it, but the enhanced layout of the app also makes it easier to personalize and navigate the S Health dashboard. The pinch-zoom function can adjust the screen grid according to your preference, improving the overall user experience. * Gear Fit2 pairs with smartphones running on Android OS 4.4 and higher with over 1.5GB RAM. ** Quick Measure operates with Android 6.0 when activated. Not compatible with Galaxy S5 and Alpha. *** The latest update of S Health is compatible with the Galaxy S6, Note5 and S7. All functionality features, specifications and other product information provided in this document including, but not limited to, the benefits, design, pricing, components, performance, availability and capabilities of the product are subject to change without notice or obligation.